All proceeds benefit the Doris Day Animal Foundation. For seven decades, Grammy-winning, Oscar-nominated, Presidential Medal of Freedom honoree Doris Day has epitomized performing excellence, setting the standard for countless female singers and actors who have attempted to follow in her path. But the truth is, there has never been anyone else who has achieved the level of artistry, success and worldwide devotion that the woman born Doris Mary Ann Kappelhoff in Cincinnati, Ohio, has enjoyed ever since becoming a teen-aged songbird with the Les Brown Orchestra (Sentimental Journey) during the World War II era. Far beyond dozens of hit records such as It’s Magic, Secret Love and Que Sera, Sera (Whatever Will Be, Will Be) and 39 motion pictures including classics ranging from Pillow Talk andPlease Don’t Eat The Daisies to Calamity Jane and Love Me Or Leave Me, Doris Day has become virtually as well-known and beloved for her dedication to the welfare of animals, a passion that she has pursued with the same degree of commitment as her entertainment career. 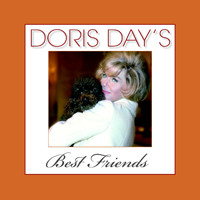 DORIS DAY’S BEST FRIENDS celebrates Doris’ lifelong love affair with animals, presenting dozens of heartwarming and often humorous images from her film and television career in addition to candid and behind-the-scenes shots, many from Doris’ private archive and never-before-published. Today, Doris enjoys a quiet life at her home in Carmel, Calif., away from the showbiz spotlight, keeping busy caring for her animals and tending to the affairs of her top priority: The Doris Day Animal Foundation. The charity provides scholarships and promotes legislation and special programs that benefit dogs, cats, horses and other four-leggers.